Leader of Tehreek-i-Minhaj-ul-Quran Dr Tahirul Qadri has said that the parliament of the people of Pakistan being held in Islamabad on 14th January would bring a public revolution in the country. He said that the flag of the revolution for bringing happiness to the faces of oppressed people was raised in Lahore at the Minar-i-Pakistan on 23rd December and the practical struggle has started from Karachi. He said this while addressing a huge public gathering in the Jinnah Ground in Azizabad. Dr Qadri said that the coming together of the city of the Quaid-i-Azam and the city of Allama Iqbal for restoring the rights of the 180 million oppressed and downtrodden people and for eliminating feudalism and exploitation in order to bring a real democracy in the country is an indication of help from Allah. 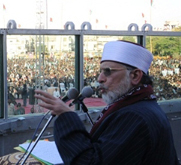 Dr Qadri said that he has come to Nine Zero to thank Altaf Hussain for his support for restoring the true spirit of democracy, bringing a just and equitable system, and revitalizing the social and spiritual values of Islam, for establishing peace and order in the country, for eliminating corruption and sending truly representative people in the elected houses. He said on oath that there was no foreign power or agency behind his agenda. He made it clear that he does not desire any office. He categorically refuted that he wanted to become the caretaker prime minister. He asked the people if the rulers were exercising the authority as a sacred trust. The people waved their hands and said, “No”. Speaking about the changes in the electoral reforms, Dr Qadri said that he would announce the detail agenda in a few days. But he said that only those should be allowed to contest the elections who fulfil the legal and constitutional requirements under article 62 and 63. In the end Dr Qadri thanked for strong support given by Mr Altaf Hussain and declared that all future decisions would be taken with consultation.